Usyk v Bellew is one of the biggest fights of the year and if Bellew’s comments are anything to go by it’ll be the fight he retires on, win or lose. Below I’ll be showing you how you can watch this fight live anywhere in the world. If you’re a boxing fan but you’re outside the UK then watching this particular fight can be difficult. With other fights taking place on the same day such as the WSS quarter-finals from the US many international networks are choosing to stream this. Boxing fans need not worry though because wherever you are in the world there is a simple trick that will let you watch the Usyk v Bellew fight live online. How can I watch the Usyk v Bellew fight outside the UK? The Usyk v Bellew fight is being shown live in the UK by Sky Box Office. One little known fact is you don’t need to be a Sky customer to watch this. In fact, you don’t even need any kind of Sky or Now TV box either. Simply by purchasing a Sky Box Office fight pass for the Usyk v Bellew fight you can watch online on your laptop, computer, phone or tablet. If you try and watch the fight outside the UK you’ll be blocked even if you purchase the pass. So for this you’ll need an extra app called a ‘VPN‘ that allows you to unblock the fight in any country. How much is the Sky Box Office fight pass? The fight costs £19.95 which is roughly US$26 plus you’ll need a VPN app to unblock the fight in a country outside the UK or Ireland. I recommend using ExpressVPN because they’re really easy to use and if you take their annual package you can save 49% off the price compared to paying monthly. It works out as a couple of quid (or dollars) on top of the fight pass price which is really good value considering you can watch anywhere in the world. There are a couple of other good providers of VPN apps and you may want to check out IPVanish, NordVPN or CyberGhost VPN too. How can I use the VPN to watch the fight? Bellew or Usyk fans don’t need to worry because using the VPN to unblock and watch the fight in any country is super simple. Follow the steps below where I show you how to use ExpressVPN to watch Usyk vs Bellew. Download their app and open it. Login or activate the app when required. Press ‘Choose Location‘ (1) then press ‘United Kingdom‘ (2). Wait for the app to automatically connect or press ‘Connect‘ (3) if not. Watch Usyk vs Bellew with ExpressVPN. Now you’re connected visit the Sky Box Office page. Press ‘Buy Event’ and make your purchase. At the time of the fight login to the website to watch the fight live. That’s it! Yes really. There is nothing more to do. In just 8 simple steps you can watch what will likely be Tony Bellew’s final fight before he retires. 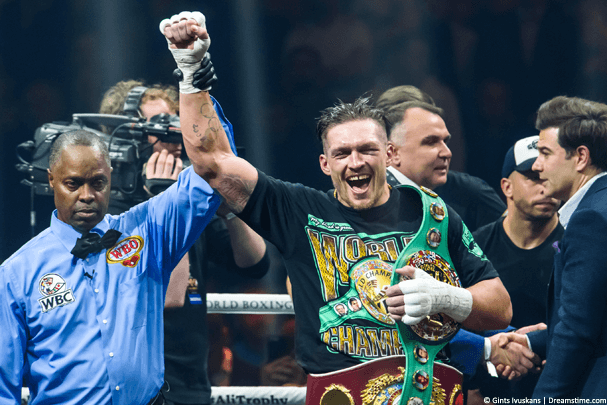 Is he going to retire in a fit of glory or will Usyk stop his dreams of retiring on a high? I honestly can’t tell you the answer to that but at least you’ll be able to watch for yourself as history is laid down. What time and date is the Usyk v Bellew fight? The Usyk v Bellew fight is taking place on Saturday, 10th November 2018. The event will start from 6 pm GMT/UTC and is expected to run until around 1 am. The headline fight between Usyk and Bellew should be taking place around 10 pm but it’s best to tune in 30 minutes to an hour before just in case so you don’t miss any of the action. They’ll be fighting for the WBC, WBA, WBO, IBF & Ring Magazine World Cruiserweight titles. Who are the undercard fights? Not only are Usyk and Bellew fighting but there is a host of other undercard fights that you’ll also be able to watch with your Sky Box Office and VPN combination. Who is going to win the Usyk v Bellew fight? Hey, if I could tell you the result of the fight I wouldn’t be here right now telling you how to watch the fight. I’d be down the betting office putting a huge bet on. Joking aside though it’s one of those fights that are extremely difficult to predict the outcome of. Tony Bellew will be fighting for his life to end his career on a high. Equally, Usyk will be hoping to continue his 15 fight unbeaten run. Bellew has had 33 professional fights winning 30, drawing 1 and losing 2. Usyk on the other hand sits with 15 fights with 15 wins, 11 by knock-out. Oleksandr Usyk is without question the favourite to win this fight and even Bellew himself has admitted he’s the underdog. However, he still rates himself and has said he won’t be in awe of Usyk. Expect this to be one explosive fight and with a VPN from ExpressVPN plus a Sky Box Office fight pass you’ll be able to watch all the action in any country. To watch the Usyk v Bellew fight live anywhere in the world you’ll need two things. 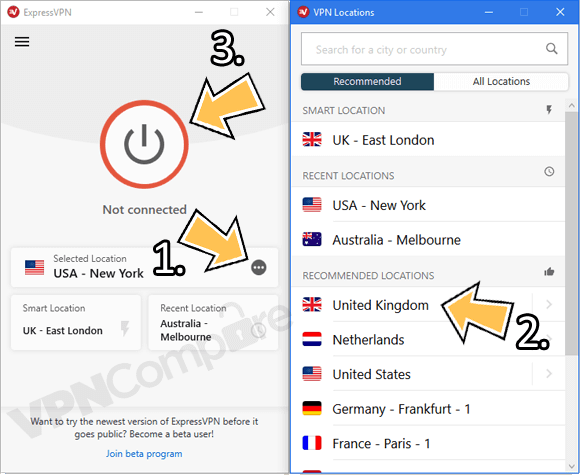 First you’ll need a VPN app from ExpressVPN which you can get by clicking the button below. You’ll also need a Sky Box Office fight pass which usually only allows viewers in the UK and Ireland to watch. By using the VPN app you can unblock the live stream on Sky Box Office and watch in any country in the world. Who do you think will win this fight? I would love to know what you think Uysk and Bellew’s chances are. Why not let me know in the comments section below and tell me where in the world you’ll be watching from.